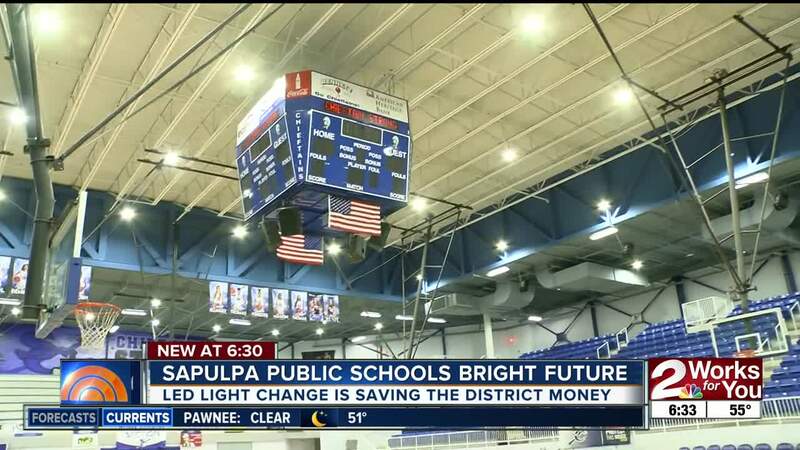 SAPULPA — One local school district is saving 70 percent of its electric bill or $116,000 a year after converting to LED lights. Funding for schools is always a hot button issue in Oklahoma, so many school districts have to get creative when budgeting out their year. Think about the last time you walked into a school gymnasium -- yellow flickering lights that take 15 minutes to warm up and sound like a swarm of bees are invading. Well, that isn't happening anymore at Sapulpa Public Schools after Oklahoma LED came in to replace those old lights throughout the entire district. "What we've replaced them with is 150 watt LED UFO fixtures, which are 5,000 Kelvin temperature, which means it's whiter and considered daylight," Joe Schrader, CEO of Oklahoma LED said. Schrader said LED lights require virtually no maintenance and last 50,000 hours or higher, which means in a school, they'll last 20 plus years. "We removed the ballast," Schrader said. "Ballasts are the number one item that burns out or goes out and not having to replace ballasts ever is a huge cost saving for the schools." Aaron McColloch with Sapulpa Public Schools said these new LED lights are saving the school a lot of money. "It's huge savings," McColloch said. "We're going to be saving around $116,000 a year." McColloch said administrators, players, and fans alike are all excited about what the new lights can do for the district, especially in the gym. "It's the first basketball season where we've had the lights," McColloch said. "The first game, when the fans came out, they were saying, 'What's going on? what's new?' and they were looking around, and our athletic director was telling them it's the lights. It just made this older facility feel new." The Department of Energy says the energy saving is equal to planting over 11,000 trees or removing almost 1,000 cars off the road. "OG&E, PSO and other power companies are offering rebates, which is free money to these schools to convert their lights to save energy." Sapulpa had OG&E's largest school and government rebate last year which was $178,000. With the savings the district is making and the lights paying for themselves within the next four years, McColloch said there some ideas about what the school district will put the money towards. "That's about four years down the line before we can really start to figure how we can reallocate those savings and put them somewhere else, but we're going to be able to do that," McColloch said. Oklahoma LED has converted 125 public school districts in Oklahoma so far. That includes Sapulpa, Sand Springs, McAlester, Nowata, Hartshorne, Vinita, Barnsdal and several more in Green Country.